This page currently contains links to external articles, forum posts, blog posts, reviews and art projects inspired by or associated with Rick Roderick. Feel free to add others you are aware of in the comments. It’s hard to be an intelligent citizen (human) without knowing the framework of the world within which one lives. Rick Rodrick enables the herculean task of tracing the histories of though and the makings of our culture. The lectures are great. Thanks for making this jewel of knowledge available. Hi to whoever is running and curating this website! I want to thank you sincerely for all the work you’ve done maintaining Rick’s legacy. I don’t know that a project like this is something my brothers or I would ever have gotten around to, and the transcriptions of my father’s lectures especially have been a great help to me while writing an essay about him over the past few months. If it isn’t too much trouble I’d love to hear from you by email, hopefully to hear about your connection with Rick, but on a more personal level I’d like to be able to thank you by name in the essay. I’ll speak to my publisher about possibly making it available on this website, if that’s something you’d be interested in too. Rick Roderick, while I never knew or met him is one of the best friends I’ve ever had. 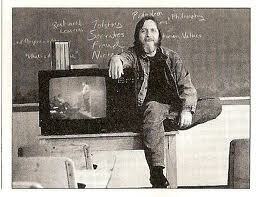 His lectures have been one of the reasons I know I’m not crazy but this full on Postmodern world is. I wonder what Mr. Roderick would have had to say about the year 2018 with Donald Duck (er I mean Trump) as Emperor? I think he might have thought reincarnation was a reality and that Ronald Reagan was back for another go at things. Much of what he was seeing as a danger has come true with a vengeance and long before most anyone else was even thinking about it. Being old and out of sorts due to an inability to find anything of value in my culture, RR’s lectures have been one of my only touchstones for sanity. (Bless you whoever has put them online) Anyway I miss him very much. The world is just a little colder and less sane without him. He died too soon for me but just in time to avoid seeing the last of Democracy circle and go down the drain.